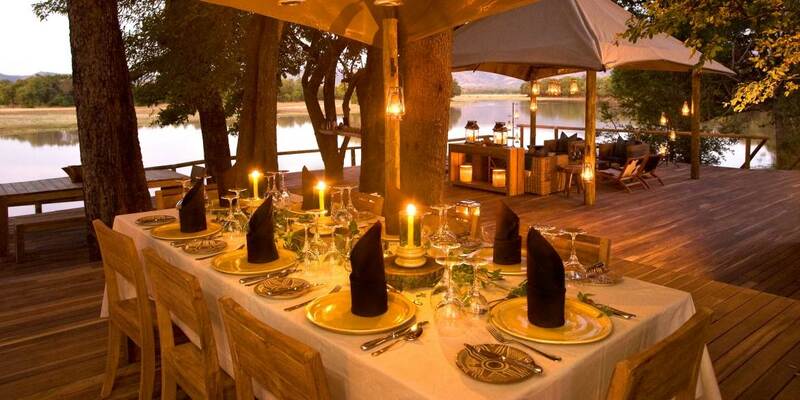 Chindeni Bush Camp is an incredible, beautifully located, contemporary tented camp on the edge of a permanent ox-bow lagoon with the Nchendeni Hills providing a truly breath-taking backdrop. Blessed with such an enviable location, it is undoubtedly one of the most sublime tented camps in the South Luangwa National Park. Bordered on one side by the Muchinga Escarpment and the Luangwa River on the other, the park consists of 9,059 square kilometres (half the size of Wales or Massachusetts) of untouched wilderness supporting one of the greatest concentrations of wildlife in Africa. Whether its guests are in the mood for intrepid exploration or perhaps some more sedentary wildlife viewing, Chindeni Bush Camp delivers. 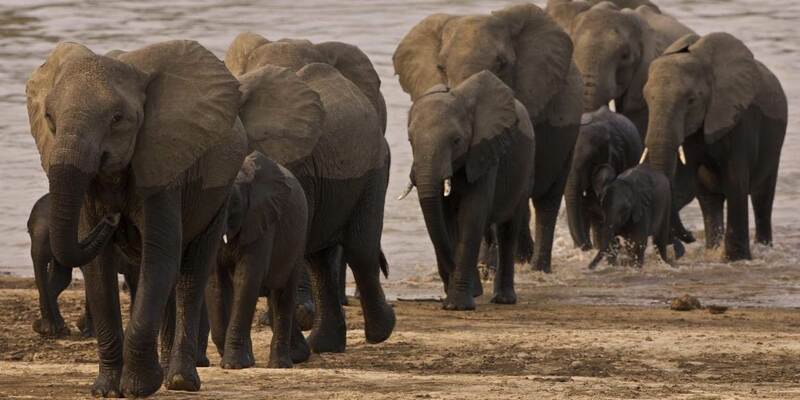 For wildlife-lovers, avid game viewers and keen bird-watchers it doesn’t get much better than the South Luangwa National Park. With its verdant floodplains rustling with huge herds of game, mopane woodlands and indigenous hardwood forests filled with over 400 species of birds, and a mighty river that attracts thirsty animals like a magnet, it’s a natural utopia and one of Africa’s truly great wildlife sanctuaries. The now popular ‘walking safari’ originated in this park and is still one of the finest ways to experience Africa’s pristine wilderness first hand. Walking safaris are a speciality at Chindeni Bush Camp; their guides have very impressive tracking skills which makes it an exciting activity. 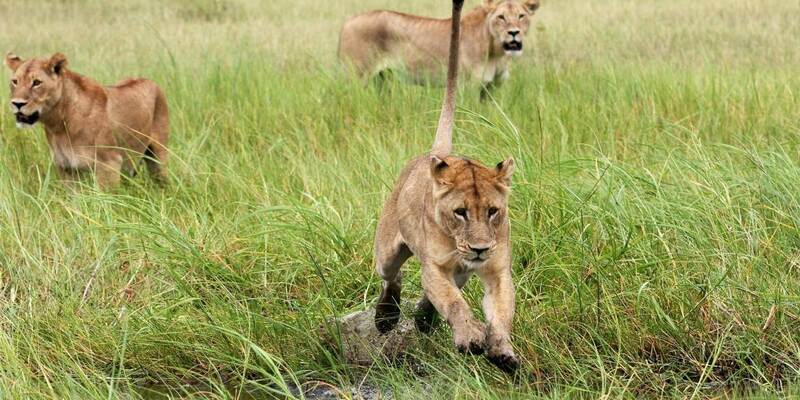 This is perhaps the most magical way to experience the beauty of Africa and become fully absorbed in the wilderness. Activities at Chindeni Bush Camp follow a slightly different format to other camps and usually consist of early morning walks after breakfast with an expert guide, then back to the camp for brunch. Afternoons are for relaxing, taking a siesta, or watching the abundance of game that is drawn to Chayumba Lagoon from miles around. It is quite possible to see as much wildlife on the lagoon during an afternoon from the comfort of camp as on a morning or evening game drive. Following a delicious afternoon tea, guests venture out in a four-wheel-drive safari vehicle for an early evening drive. After sundowners at a suitably scenic spot, guests have the opportunity to observe the bush under the cover of darkness when many of the nocturnal creatures are most active. Leopard, hyena, porcupine, bushbabies and elusive aardvark can all be seen on these exciting night drives. Morning game drives can also be arranged which allow guests to cover more distance quickly and comfortably than walking safaris, with decent sightings of lions, leopards, jackals, spotted hyenas, hippos, crocodiles and elephants, as well as a wide range of lesser game and prolific birdlife. Wild dogs are occasionally sighted too. The only notable exception is the rhino, which have sadly been poached to extinction. In a camp as small as this, it is the staff as much as the animals which make the experience unforgettable and Chindeni Bush Camp is renowned for the excellence of its kind, affable and professional staff. 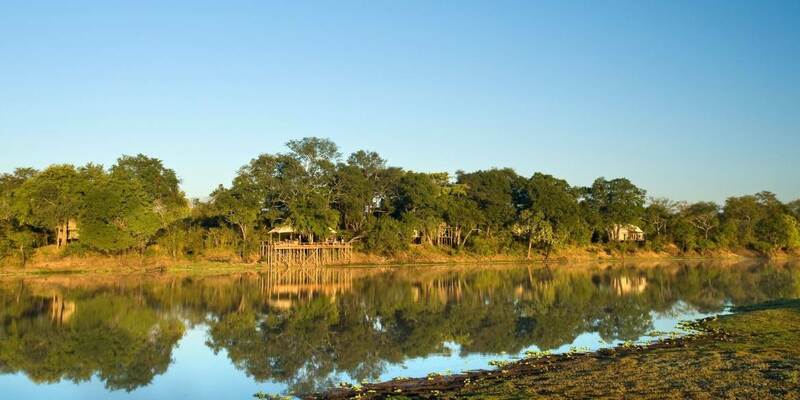 Built under a shady grove of ebony trees overlooking the lagoon, Chindeni Bush Camp is one of the South Luangwa Valley’s most luxurious, well-furnished, modern camps. 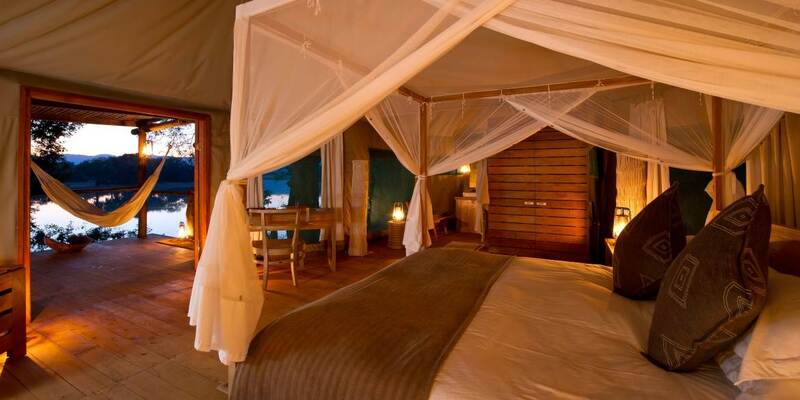 With a style described as ‘Afro-chic’, it is perfect for safari enthusiasts looking for that extra level of comfort in a camp, although it may not be as rustic as some traditionalists would wish for. It’s four large, opulent tents with stripped wooden floors, four-poster beds, cosy sitting rooms, en-suite bathrooms and vaulted canvas ceilings, are so inviting that guests could be forgiven for never wanting to leave the room, especially as so much wildlife can be observed from the private deck jutting out over the lagoon. Built on raised wooden platforms, two of the open-plan tents have twin beds (queen-sized beds), while the other two each have a king-size bed, all with two hammocks suspended on the verandas with superb views over the lagoon. The central communal lounge and dining area is arranged on several levels of varnished decking, built around the surrounding ebony trees, with spectacular views. Shaded by a suspended canvas roof, the upper tier incorporates the dining area, whilst the lower tier houses a comfortable and stylish lounge, with cow-hide chairs, hand-crafted side tables and hand-blown glass vases. There is also a small, well-stocked bar. Chindeni Bush Camp is open from May until December.